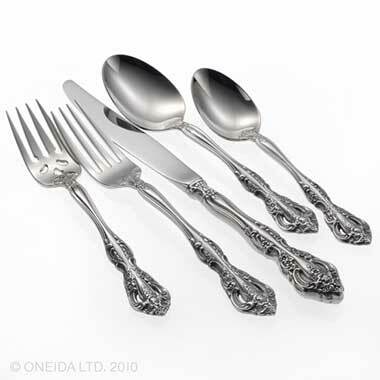 Oneida's Michelangelo Flatware Pattern is the epitome of elegance and intricacy. Ornate details such as piercings, symmetrical flowers and a scroll motif weave their way throughout each piece. Each rock-solid 18/10 stainless steel piece features a hi-luster finish, ensuring the sheen isn't upstaged by the beauty. Additionally, this piece is machine washable and is covered by a limited lifetime warranty.